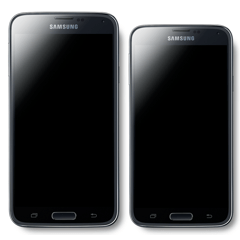 The Samsung Galaxy S5 mini, just like the HTC One mini 2, has a 4.5-inch HD display, but the display technology used here is the Super AMOLED one which is used in the flagship smartphones from Samsung. The company has tried to include whatever was given in the Samsung Galaxy S5 (check our review), thus you would see the IP67 certification for water resistance, and there is Finger scanner. The smartphone is powered by 1.4 GHz Quad-core processor, coupled with 1.5GB RAM and the internal storage in the device is 16GB. The Galaxy S5 mini comes with a 8-megapixel rear camera with LED flash and 1080p video recording, and a 2.1-megapixel front-facing camera which too is capable of recording Full HD videos. The S5 mini runs Android 4.4 KitKat OS layered by the TouchWiz UI on the top. The flagship devices have been getting accompanied by their mini versions, which compromise with everything and gets a smaller screen, but the interface has almost the same stuff which the original one has got. Samsung’s 2014 flagship, the Samsung Galaxy S5 was launched sometime back, and it isn’t a surprise that we are getting to see a few rumors about its mini version, the Galaxy S5 mini which has the model number SM-G800 and Samsung although hasn’t officially revealed any details about it, there was a support page put up on the Finnish portal of Samsung, for this particular model number. But again, the model number SM-G800 is for the S5 Mini is not what Samsung has said, but we are assuming that and just hoping that its the same. The web page on the Samsung’s website shows just the model number and no additional info about the device, but there are no less rumors already talking about the different specs of the device. If any of the rumors are to be believed, the Samsung Galaxy S5 mini will have a 4.5-inch 720p display with the Super AMOLED tech, and the internal system includes a Qualcomm Snapdragon 400 chipset, a quad-core one with 1.5GB RAM and there would be 16GB internal storage. The rear shooter will be an 8MP sensor, while on the front there would be a 2MP camera. This is quite a lot of compromise on the specs, but that is what a mini version usually is all about. Either go with the hugely powered original large version, or with the totally compromised lower variant, based on the need. There is no talk around the IP67 certification which the S5 had for the water and dust resistance, and about the heart rate sensor as well which comes to provide the heart rate of the user through the S Health app. If these are present in the S5 mini, it would be a perfect deal for those who were disappointed with the pricing of the S5 set by the company. And if these features aren’t included, then that is an ever bigger disappointment because one won’t buy a mini version with no special goodies included, and that too with Samsung, which comes up with designs no one can boast about. For someone who’s actually interested in a mini version of the flagship device, you shouldn’t miss checking out the HTC One M8 mini which is also in the pipeline and we might see both around the same time. And according to the rumors flowing around, the HTC One M8 mini might have specs somewhat similar to that of the S5 mini, thus a better choice for us would be the one from HTC at least for the design, although the company might surely compromise with the features such as the Dual camera. Interestingly, each of these mini versions still have a screen size larger than that of the Apple’s latest smartphone, the iPhone 5s. The only well comparable Android smartphone with some excellent specs included is the Sony Xperia Z1 compact, which was actually the Xperia Z1, only shrunk to bring a smaller screen size, and there wasn’t much change with the specs. Update (6th May): Zauba, the shipment tracking website, has mentioned about the screen size of the S5 mini, and that is said to be 4.47-inch, which rounding off could be mentioned as 4.5-inch, confirming the rumors that were flowing around. Let us wait and watch, until Samsung comes up with something interesting when it announces the S5 mini.